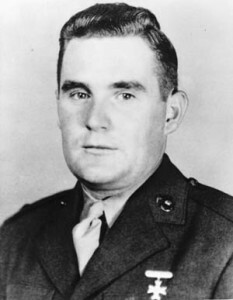 Marine Lieutenant Jack Power earned the Medal of Honor on the island of Namur. Outside City Hall in Worcester, Mass., stands a soldier who has been on guard duty since 1947. Atop an eight-foot granite pedestal, he never flinches in the hot August sun or when February winds whip along busy Franklin Street. Square-jawed under a combat helmet and with an M-1 carbine slung over his shoulder, he stands with one leg slightly forward and a hand lightly clasping his long trench knife. He looks life like, this young U.S. Marine, of muscular build and slightly below average height, right down to the wristwatch on his left arm and the globe and anchor insignia on his shirt pocket. For the citizens of the central Massachusetts city, he is a daily reminder of those critical years, 1942 to 1945, when a generation of young Americans went forth—reluctantly but gamely—to help save the world from fascist tyranny. The eight-foot bronze statue is a striking likeness of a hero, Marine Lieutenant John Vincent Power of Worcester, one of those thousands of Americans who went to war but did not return. He was posthumously awarded the Medal of Honor for his heroism while serving as a platoon leader with the 4th Marine Division on Namur Island in the bloody Marshall Islands campaign on February 1, 1944. Lieutenant Power was the first Massachusetts serviceman to gain the nation’s highest honor in World War II and one of two Medal of Honor winners in that conflict claimed by Worcester. The other was Navy Chaplain Joseph T. O’Callahan, a College of the Holy Cross mathematics professor, who distinguished himself aboard the crippled aircraft carrier USS Franklin in the Pacific on March 19, 1945. Jack Power was born on November 20, 1918, the son of Patrolman and Mrs. George F. Power of Austin Street, Worcester. He graduated from Classical High School in 1937 and then went to the nearby College of the Holy Cross, a Jesuit institution. He excelled in intramural sports and debating and graduated with a Bachelor of Arts degree in 1941. “Jack was a grand boy,” his mother recalled proudly. “Everyone called him ‘Sunshine’—he was full of fun,” said his sister, Patricia. Although he had no military ambitions, Power left a good job in Philadelphia to enlist in the Marine Corps in August 1942. He reported to the Quantico (Va.) Training Depot that October. He applied himself in good spirits to the tough basic training, and was commended for his skill in leading a platoon in simulated combat exercises. He was promoted to second lieutenant at Quantico, after which he was assigned to New River, N.C., and then Camp Pendleton, where he became a platoon leader and was stationed until going overseas in January 1944. Jack Power was a good officer and was popular with both his brother officers and the enlisted men. He never stopped kidding, and his sense of fun was infectious. Soon after Power arrived at Camp Pendleton, the battalion commander led the unit out into the dry, dusty hills for 11 days of “shakedown” exercises to “separate the men from the boys.” Those who lasted that long were almost done in on the 11th day, but not Jack Power. He just bounced around on the balls of his feet, ragging the other exhausted young recruits. That was Jack Power. On the surface, everything seemed to be a big joke, but underneath he was serious. Although he said more than once that the other fellows could have the glory and that he intended to turn over his platoon to the platoon sergeant and “post-troop it until the lead stops flying,” he really wanted to do something worthwhile in the war. He envied returning combat veterans with campaign ribbons on their chests and felt self-conscious about his own bare tunic. To the enlisted Marines, with whom some of his superiors thought he was “too familiar,” Power confided that on his first combat mission he intended to earn either “a good medal” or a promotion. Finally, after all the drill and maneuvers in the California hills, it was time to ship out. When elements of the newly created 4th Marine Division sailed for the Marshalls campaign in January 1944, Lieutenant Power was a platoon leader in Colonel Franklin A. Hart’s Combat Team of the 24th Marine Regiment. Jack was just as fun loving as ever as the crowded, heaving troop ship headed westward across the Pacific. No heroics for him on this, his first venture into combat; he was “just along for the ride.” Deep down, the patrolman’s son was grimly determined to do his best and live up to the fighting traditions of the U.S. Marine Corps. The ghosts of Chapultepec, Tripoli, Peking, Belleau Wood, Wake Island, and Guadalcanal rode that troop ship with Jack Power and his men. Jack’s determination led him at times into secret bouts of depression. In letters home to his fiancée in Woonsocket, R.I., he had expressed vague doubts about his future. Perhaps the happy-go-lucky young Irishman had a premonition of death. After the capture of the Gilbert Islands, the Americans turned their attention to the Marshalls, where the Japanese had airfields on six atolls. The Marshalls would provide an air base within B-29 Superfortress bombing range of Japan. The assault force would comprise the 27th Infantry Division (New York National Guard) and Maj. Gen. Harry Schmidt’s 4th Marine Division. While the 27th Division would assault Kwajalein Island in the center, the 4th Marine Division would send the 23rd and 24th Regiments against the little twin islands of Roi-Namur. At 8 am on January 31, 1944, three U.S. Navy battleships and two score of cruisers and destroyers started bombarding Roi-Namur. The naval batteries were still pounding the islands the following morning when the Leathernecks started assembling for the invasion. In the gray dawn of Tuesday, February 1, after a hearty prebattle breakfast, the gear-laden men of the 24th Regiment clambered down nets from the landing ships off Namur Island and rode bucking landing craft through the surf. This was it. The 23rd Marines were scheduled to hit the Roi beaches at 10 am, but local squalls delayed the landing until noon. The 23rd Marines met minimal opposition when they went ashore, and they secured Roi by nightfall. Meanwhile, Lieutenant Power’s boat was in the 24th Regiment’s assault wave and was the first to hit the beach. Landing successfully, his platoon scrambled ashore, took cover, and then pushed inland until it was pinned down by fire from a Japanese pillbox. The Marines hugged the sandy ground while Jack sized up the situation. 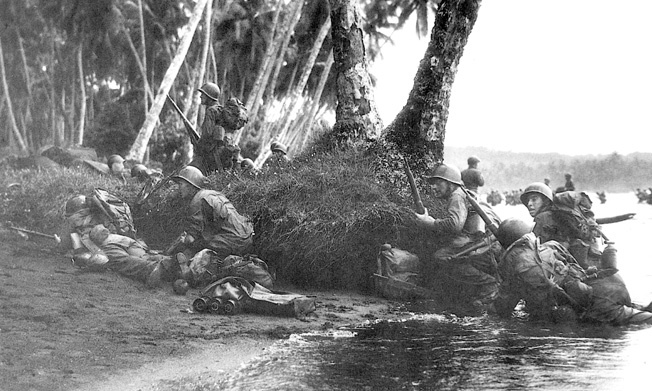 Attacking at the break of day in a heavy rainstorm, the first Marines ashore take cover behind tree trunks and and anything else they can find. Namur was more heavily defended than Roi, and the 24th Regiment faced a tougher time against the most determined opposition in the entire Marshall Islands campaign. The island was covered in jungle and thickly sown with concrete bunkers bristling with machine guns. The rookie Leathernecks bogged down several times as they tried to advance. The enemy pillbox in front of Power’s platoon loosed a hail of murderous fire. He rallied his men to try and take the emplacement with hand grenades, but they were driven back with heavy casualties. He sent back word for a demolition squad to blast the pillbox, but there was a delay. His men were still being cut down. They had been ashore only a couple of hours. Realizing that the platoon could neither advance nor pull back until the bunker had been neutralized, Lieutenant Power jumped to his feet and charged toward the pillbox, taking an enemy round in his stomach as soon as he emerged from cover. Clutching his belly with his left hand and firing his M-1 carbine with his right, he ran forward but was struck two more times. His platoon sergeant, Herbert B. Mangum of Magee, Miss., dashed forward and helped him into a nearby shell hole. He applied an emergency dressing to his wounds. Power refused to be carried back to the aid station on the beach. “You take charge, Maggie,” he told the sergeant. “I’m done for.” The sergeant left the young officer in the shell hole to be picked up by litter bearers and went forward with the platoon to assault another bunker. “Fire in the hold!” someone yelled, and Mangum and his men ducked to shield themselves from flying debris as a satchel charge exploded in the pillbox. Then, Mangum was amazed to see Jack Power lurching through the smoke and dust toward the pillbox. Clutching his bleeding stomach and blazing away at the gun ports with his carbine, the lieutenant headed straight for the opening ripped in the bunker by Mangum’s explosives. The Leathernecks watched, aghast and helpless, as Power struggled to within a few feet of the cavity. Then his ammunition gave out. The platoon swarmed up to clean out the emplacement with rifle fire and grenades. “Eight Japanese tried to escape through the rear of the dugout,” said Mangum, “but we got all of them with automatic fire.” Jack Power’s self-sacrifice would earn him a posthumous Medal of Honor. Meanwhile, the surviving Japanese on Namur attacked that night. In the pale moonlight, little knots of men fought stubbornly for survival through the darkness. With dawn, the Marines spread out to hunt down and kill the remaining enemy troops. Tanks crawled ashore, and by noon on February 2, the battle of Namur was over. Namur was also the scene of a remarkable accident. At 1 pm on the first day, a Marine demolitions team threw a satchel charge into a blockhouse which, it turned out, was a storehouse for Imperial Japanese Navy torpedo and bomb warheads. The massive explosion killed 20 Leathernecks, including the entire demolitions team, and wounded another one hundred. The force of the blast almost swatted a spotter plane out of the sky and blew men off their feet half a mile away. Roi-Namur was one of the shortest amphibious operations in the Pacific Theater. Marine casualties amounted to 190 dead and 547 wounded. The Americans buried more than 3,400 Japanese and captured 264. Two days after Namur was secured, the Army’s 27th Infantry Division completed the capture of Kwajalein Island. Power died in brave company. Two other men in Colonel Hart’s combat team won the Medal of Honor, and three-fourths of the other decorations awarded to the 4th Marine Division for the capture of Roi-Namur went to Power’s comrades. Patrolman and Mrs. Power were informed of their son’s death later in February 1944 in a telegram from Lt. Gen. Alexander A. Vandegrift, Marine Corps Commandant and victor of Guadalcanal. The proudest day of their lives came on August 30, 1944, when the Powers went to the White House to receive the posthumous Medal of Honor. Patrolman Power stood by with Jack’s three sisters in the White House study as President Franklin D. Roosevelt greeted the hero’s white-haired, 57-year-old mother. Mrs. Power thanked FDR almost inaudibly, and they shook hands. Also on hand for the simple but moving ceremony were General Vandegrift, Chief of Naval Operations Admiral Ernest J. King, and other Power relatives. The Powers went to the Bath Iron Works Corporation yards in Bath, Maine, on June 30, 1945, to help launch a destroyer named for their son. Mrs. Power smashed the traditional bottle of champagne on the bow and spilled half of it on her dress. Hundreds of spectators cheered as the trim, 2,200-ton USS John V. Power slid down the ways and into the Kennebec River. She was the 65th vessel built there since the Pearl Harbor attack. Patrolman Power sailed in her from Bath to the Boston Navy Yard for her commissioning on September 13, 1945. 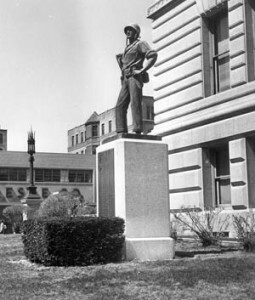 The statue of Marine Lieutenant John V. power stands larger than life on the lawn in front of City Hall in Worcester, Massachusetts. Accepting the monument on behalf of his city, Mayor Charles F. Sullivan said, “The citizens of Worcester will always be inspired by this statue.” The Worcester Brass Band played the Marine Hymn, and a Marine Corps honor guard saluted. Then a wreath was placed at the foot of the monument. Michael D. Hull resides in Enfield, Connecticut. He is a contributor to the forthcoming Eisenhower Center for American Studies World War II Desk Reference. Tags Admiral Ernest King, Alexander Vandegrift, Allies, Axis, Jack Power, Japan, Japanese, Marshall Islands, medal of honor, medal of honor recipient, Pacific Theater, United States Marine Corps.